From October 25th to December 31st 2018, The House will open a pop-up store in Sydney dedicated to the Cruise 2019 Collection. 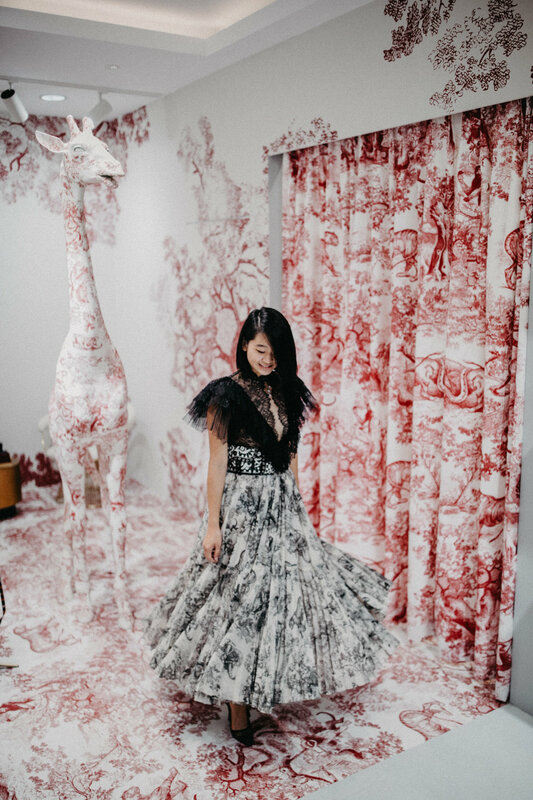 Located on 67 Castlereagh Street, the store will feature a Toile de Jouy Window Display. This iconic 18th-Century French print, which from 1947 was adorned the wall of Monsieur Dior’s first boutique at 30 Avenue Montaigne in Paris is a key Cruise 2019 component. The blue and red decorative elements have been reinterpreted by creation director Maria Grazia Chiuri, with a new energy of wild animals which come alive as 3D sculptures which ‘roam’ the store. I am extremely honoured to have been able to sample the Dior Capsule in person. From seeing the complexity of the pleating to appreciating the sheer lace fabric to the detailing of the animal motifs appearing on the products. I was so connected to this installation. Big congratulations to the amazing team for doing such a beautiful job on the aesthetics of this beautiful space.